More than 90 trade unionists from Latin America, Canada and the Caribbean met to discuss issues including challenges for trade unions and workers in ongoing debates on the future of work, the impact of technology on work and the ILO Convention on Violence and Harassment in the World of Work. A strong gender analysis was integrated into every one of these topics. PSI General Secretary, Rosa Pavanelli, arrived in Japan on 22 June for a three-day visit, invited by PSI Japan Council (PSI-JC), the National Coordinating Committee of PSI affiliates in the country. Martha was on the forefront of the fight against Ebola. Now she is worried if Liberia will be able to handle another outbreak. Nurse Martha Morris, 35, worked in a public hospital in her hometown when the Ebola virus raged through Liberia. She gave up a lot to fight for better working conditions for health workers. It's a cause she thinks is worth continuing to fight for. Worker delegates at the International Labour Conference (ILC) Call for decent work for all in the UN Global Compact on Migration. On June 5th, PSI General Secretary Rosa Pavanelli took to the floor at the International Labour Conference to argue against the newly proposed labour legislation in Brazil. On the sidelines of the International Labour Conference, PSI is hearing stories of unionists from across the world, fighting for their most basic workers’ rights. Interview with Santiago Yupe Perén, Secretary General of the Sindicato de Trabajadores del Instituto de Fomento Municipal (SITRAINFOM), Guatemala. PSI General Secretary, Rosa Pavanelli, gave a speech at PSI Japan Council's (PSI-JC) 30th anniversary which took place in Tokyo on 22 June 2018. This was part of a three-day visit, invited by PSI-JC, the National Coordinating Committee of PSI affiliates in Japan. Join PSI and global trade unionists in a walk for social justice! Download campaign materials here and find out more about the Route of Shame 2016. PSI General Secretary, Rosa Pavanelli, spoke at the 104th International Labour Conference (ILC) on Friday 5 June 2015. Find here the statement read by PSI General Secretary, Rosa Pavanelli, at the International Labour Conference (ILC) on Thursday 5 June 2014. Banners (in pdf) for the 'Route of Shame 2014' bicycle ride. The banners can be downloaded in English and French. Campaign materials for the 'Route of Shame 2014' bicycle ride. Flyers (in pdf) for the Route of Shame 2014 bicycle ride. Flyers can be downloaded in English, French and Spanish. Badges (in pdf format) for the Route of Shame 2014 bicycle ride. 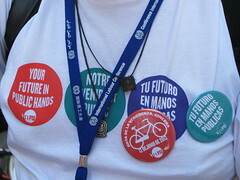 Badges can be downloaded in English, French and Spanish. Logos (in pdf and jpg) for the Route of Shame 2014 bicycle ride. Logos exist in English, French and Spanish. PSI Presentations on the 'Route of Shame', taking place in Geneva on Wednesday 4 June 2014. Presentations can be downloaded in English, French and Spanish. 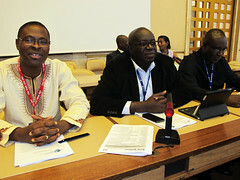 Every year, the International Labour Conference (ILC) takes places in Geneva. It brings together more than 5000 delegates and is often called an international parliament of labour. The Conference establishes and adopts international labour standards and is a forum for discussion of key social and labour questions. The ILC took place 5-20 June 2013. PSI General Secretary, Rosa Pavanelli's final presentation to the International Labour Conference summarising PSI's perspectives on public sector reform and the ILO. Campaign materials for the Route of Shame bicycle ride. Public Services International (PSI) welcomes the report and the excellent work done by the Committee of Experts, considering that this is the first time that collective bargaining in the public service is being addressed in a General Survey. Trade union rights remain the top priority for public sector unions around the world. This is certainly a timely report that exposes many of the challenges that trade unions face in the public sector. The 106th session of the International Labour Conference (ILC) will take place in Geneva, Switzerland, from 5 to 16 June 2017. It will be held at the UN Palais des Nations and ILO headquarters. At a time when inequality is rising and public services are being cut, the Panama Papers have shone a new light on corporate accountability. We are looking for new ways to fund development - tax policy has never been more relevant. Route of Shame 2016: Walk for social justice! 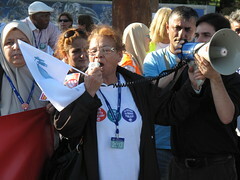 PSI and global trade unionists walked for social justice in Geneva. Around the world, populist politicians are raising the flag of racism and xenophobia to hide the fact that they represent the interests of the few, not the many. PSI calls for global solidarity with refugees and the respect of their human rights. 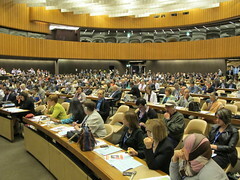 The 104th Session of the International Labour Conference (ILC) will be held at the Palais des Nations and the ILO headquarters in Geneva, from 1 to 13 June 2015. PSI will be organising its second “Route of Shame” this year - a bicycle ride calling for the respect of trade union rights in Geneva and other cities around the world. The Conference will be held in Geneva (Switzerland), at the Palais des Nations and ILO headquarters. Please note that Tuesday 27th May will be devoted to preparatory meetings requiring the attendance of the tripartite members of national delegations to the Conference. Join us in calling for the universal protection of workers’ rights and social justice! Radio Labour reports from the Interntional Labour Conference 2015 with the speeches by trade union leaders Rosa Pavanelli, PSI General Secretary and Sharan Burrow, ITUC General Secretary. 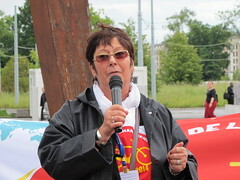 Public Services International and trade union leaders from around the world joined in Geneva for the "Route of Shame" on 4th June 2014, calling for the right to strike for all workers and shaming countries where workers' and trade union rights are violated. Quality public services and social justice are key to achieving equality, equity and dignity. On the same day, PSI affiliates in Guatemala, Panama, Buenos Aires, Lima, Santiago de Chile, Paraguay, Bangladesh, Indonesia, Tokyo and Seoul also organized "Route of Shame" actions. International solidarity makes us stronger! The Route of Shame is a solidarity action organized by Public Services International, calling for the right to strike and shaming countries that violate workers' rights. On 4th June 2014, the second edition of The Route of Shame brought together trade unionists from all over the world and all sectors in Geneva and in Guatemala, Buenos Aires, Paraguay, Sao Paolo, Panama,Tokyo, Indonesia, Santiago de Chile, Lima and other cities (more updates soon). During the International Labour Conference in Geneva, June 2013, Public Services International interviews Luis Lara, President of Sindicato Nacional de Trabajadores de Salud de Guatemala (SNTSG), a PSI affiliate. In parallel to the Geneva Route of Shame eventhref>, PSI affiliates organized similar actions in Lima, Caracas, Buenos Aires, Quito and Bogota. International solidarity makes us stronger and unites PSI! Led by members of the global union federation Public Services International (PSI), trade union leaders from around the world join in a ‘Route of Shame’ bicycle ride Wednesday 12 June and visit missions and embassies in Geneva, Switzerland to draw attention to countries which consistently violate workers’ rights. The International Trade Union Confederation (ITUC) and Sustainlabour organized 3 Webinars (online seminars) to introduce the issue and the process to union delegates or union experts interested in doing advocacy work in the capitals prior to the next ILO International Labour Conference.